Impressive International “Rorschach” Poster For Paul Thomas Anderson’s 'THE MASTER'! 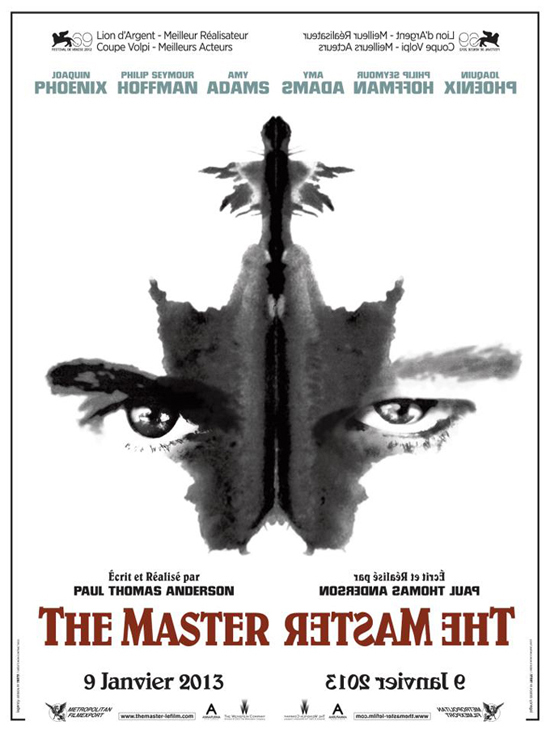 A Rorschach inspired French poster has been released for Paul Thomas Anderson’s The Master. The movie centres on the relationship between a charismatic intellectual known as the Master [Philip Seymour Hoffman], whose faith-based organization begins to catch on in America, & a young alcholic drifter [Joaquin Phoenix] who becomes his right-hand man only to begin questioning his manipulative mentor. The Master creates the faith-based organization after witnessing the horrors of WWII, in an attempt to rediscover who he is in post-war America. Laura Dern, Amy Adams, Jesse Plemons, Lena Endre & David Warshofsky also star. The movie marks the fifth collaboration between Anderson & Hoffman, following Hard Eight, Boogie Nights, Magnolia, & Punch Drunk Love. The poster actually first appeared at secret screening of the movie in San Francisco a few weeks back, where it was also available to buy. I'm reading: Impressive International “Rorschach” Poster For Paul Thomas Anderson’s 'THE MASTER'!Tweet this!